Gamma MX Hoody - Mens is rated 4.4 out of 5 by 41. Rated 3 out of 5 by telebump from Great features but... Arctyrx Gammas have a great upper body fit, however you need really small hands to get them off without turning the jacket inside out and making a fool of yourself in the process. Why there aren't wrist zips or velcro cuff on such an otherwise high quality jacket is a mystery. Also, The original Gammas were a bit more stylish. And lastly, the world would really love to have the soft shell with a semi-high loft fleece insulation. This jacket is so cool it requires a hoody or a sweater under it or an annoying layer over it on all but the warmest mountain winter days. Please Arctyrx, make us a a same fitting Gamma version with wrist loops or zips and a bit more insulation. Rated 5 out of 5 by JamesK from This jacket is a gem. Fits me very well (5'9" and about 180lbs w'/stocky build) with a size large and there is definitely room for me if I need an underlayer (not too bulky of an underlayer though). Performs really well in wind and held its own nicely in a little bit of a downpour while playing in Glacier Park. The sleeves are a little narrow for when you're taking the jacket off but that's not as problematic for me given how I will use this jacket. I can see it being a problem for those engaged in more technical outdoor activities. Overall, this jacket is perfect for me and I can't recommend it highly enough! Rated 5 out of 5 by TheCanadian from Excellent all round jacket I absolutely love this jacket. Where I live it is the perfect jacket for my local climate. It keeps me warm and dry with ease. The only thing that I would change about it is have the front of the jacket cut a little bit longer. I use this jacket to go fishing, hiking, snowboarding, you name it. I am normally a Large when it comes to Arc'Teryx but the Gamma MX hoody I found to fit a bit small (due to it being cut short in the front) so I got an XL. Hope this helps. Ps: The blue jacket is just the best colour blue you will ever see! 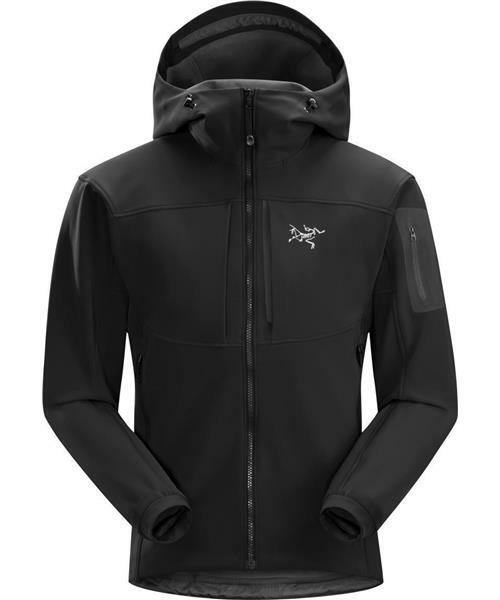 Rated 5 out of 5 by ChadS from Perfect I picked up this jacket last year (2013) because I was looking for something that was light weight and breathable for back country skiing. The jacket worked out better than I was hoping! It give great protection from the wind and snow but also breaths so you can still wear it while skinning up the mountain. I also found myself using at my go to winter jacked for walking the dog and everyday wear. Probably the most used jacket in my closet over fall and winter. Rated 4 out of 5 by Snappy from Great jacket 4.5 out of 5 if I could. I was replacing an old Cloudveil softshell used for nordic skiing, and camping. I wanted something from a Canadian company and I have had good experiences with their packs. So it was narrowed down to this jacket and the Epsilon SV. I felt the Epsilon had a better hood for regular use (without a helmet) and appeared to be quite a bit lighter. The Gamma definitely seemed sturdier and more weather resistant and the fit was not as tight as the Epsilon. I can fit some thin layers under the Gamma, and almost use it like an insulated shell if needed. As mentioned, the only minor concern is that the hood doesn't fit great without a helmet underneath. It was designed for climbing so this isn't a surprise. Fantastic fit and finish, great purchase.